Preheat oven to 325 degrees F (165 degrees C).Mix 2 tablespoons salt, and 1 tablespoon pepper, and poultry seasoning in a small bowl. Tuck turkey wings under the bird, and season cavity with about 1 tablespoon of the poultry seasoning mixture. Reserve remaining poultry seasoning mix.Toss the onion, celery, and carrots together in a bowl. Stuff about 1/2 cup of the vegetable mixture, rosemary sprigs, and 1/2 bunch sage into the cavity of the turkey. Tie legs together with kitchen string. Loosen the skin on top of the turkey breast using fingers or a small spatula. Place about 2 tablespoons butter under the skin and spread evenly. Spread the remaining butter (about 2 tablespoons) all over the outside of the skin. Sprinkle the outside of the turkey with the remaining poultry seasoning mix. Spread the remaining onion, celery, and carrots into a large roasting pan. Place the turkey on top of the vegetables. Fill the pan with about 1/2 inch of water. 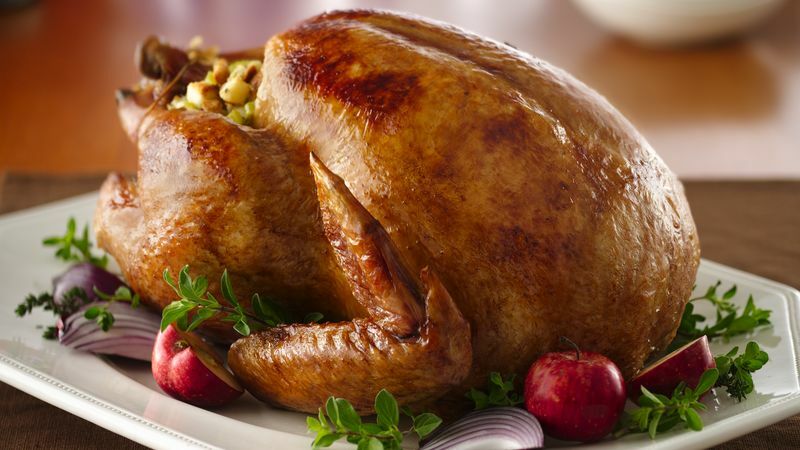 Arrange a sheet of aluminum foil over the breast of the turkey.Roast the turkey in the preheated oven until no longer pink at the bone and the juices run clear, about 3 1/2 hours. An instant-read thermometer inserted into the thickest part of the thigh, near the bone should read 165 degrees F (75 degrees C). Remove the foil during the last hour of cooking. Baste the turkey with the pan juices.While the turkey is roasting, make stock: place neck, heart, and gizzards in a saucepan with the bay leaf and water. Simmer over medium heat for 2 hours. Strain the turkey giblets from the stock, and discard giblets. There should be at least 4 cups of stock.Remove the turkey from the oven, cover with a doubled sheet of aluminum foil, and allow to rest in a warm area for 10 to 15 minutes before slicing.